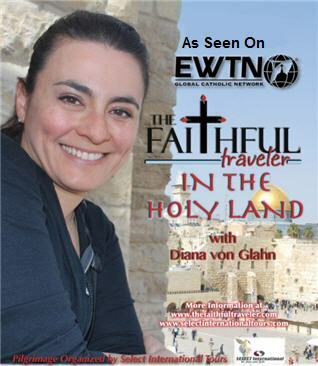 Following up on our acclaimed television series, The Faithful Traveler in the Holy Land, Diana and David von Glahn present A Papal Pilgrimage in the Holy Land. This 3-episode special explores the important history behind Papal pilgrimages to the Holy Land, including the background behind Pope Paul VI’s meeting with Patriarch Athenagoras in 1964, and the significance of the meeting of Pope Francis and Patriarch Bartholomew in 2014. • Umm Qais: Where it’s believed Jesus expelled demons into swine. • Anjara: Only Marian shrine in Jordan. • Tell Mar Elias: Birthplace of the Prophet Elijah. • Bethany Beyond the Jordan: Actual location of Jesus’ baptism by John. • Mukawir: Ruins of the palace where John the Baptist was imprisoned and martyred. • Mount Nebo: Where Moses saw the Promised Land after leading the Israelites for 40 years. He died and was buried here. • Church of the Nativity: Ancient church built atop site where Jesus was born. • Shepherd’s Field: Where angels proclaimed Jesus’ birth to shepherds. • Papal Mass at Manger Square: Watch the exhilarating Mass celebrated by Pope Francis and meet some attendees. • Wall of Separation: Where Pope Francis stopped to pray. • Basilica of the Annunciation: Where the Annunciation took place. • Church of the Holy Sepulchre: Built atop the sites of Jesus’ Crucifixion, Burial, and Resurrection. • Temple Mount: Built atop the site of the Jewish Temple. • Yad Vashem: Holocaust Museum visited by three popes. • Meeting at the Home of President Shimon Peres: To hear what some attendees have to say. • Mahane Yehuda: Jerusalem’s colorful and lively market. A Papal Pilgrimage to the Holy Land strikes the perfect balance between history, travel, and spiritual inspiration, and is a great introduction for travelers planning their own pilgrimage to the Holy Land, while giving armchair travelers the opportunity to see these magnificent locations and learn about these important pilgrimages from the comfort of their own homes. This series is not yet available on DVD, however see below on how to order our previous series: The Faithful Traveler in The Holy Land. Buy the 2-DVD set for yourself or a friend! Note: This is not A Papal Pilgrimage in the Holy Land which is not yet available on DVD. This 2-DVD set is our original 6-episode series on the Holy Land. The Faithful Traveler in the Holy Land TV series explores sacred sites throughout Israel and Palestine, including Bethlehem, Nazareth, Jericho, Jerusalem, the Dead Sea, the Jordan River, the Sea of Galilee, Ein Karem, Qumran, and more! It’s a great way to plan for or even remember your own pilgrimage to the Holy Land! Check out some clips from the six-episode series here or order the 2-DVD set for yourself or your loved ones! — Scott Danielson, of the A Good Story Is Hard To Find Podcast. Read the full review here on the Happy Catholic* website. — Lisa Schmidt, The Practicing Catholic. See the full review here. –William Newton, Blog of the Courtier. See the full review here.